Oral hygiene is the basic routine one must follow to keep the mouth and teeth free from disorders. The mouth is the gateway to the alimentary canal which receives food and saliva. Mouth is lined with a mucosal membrane and consists of the oral cavity. The oral cavity includes the teeth and the gums. The roof of the mouth consists of the hard and soft palate while the base is covered by the tongue. Salivary glands present near the mouth help to keep it moist and free from infections. Peridontum comprises the tissues that support the teeth and gums are also referred to as gingiva. Both maxillary (upper) and mandibular(lower) teeth are innervated thus enabling sensations of pain or cold and heat. The tongue helps to sense taste as well as to chew and swallow food. Lack of oral hygiene can make the mouth susceptible to disorders or infections like gingivitis, dental cavities, periodonitis, oral cysts, ulcers, oral cancer etc. Certain types of food such as green tea, onions, dairy products help balance pH of the mouth, preserve tooth enamel and kill bacteria; whereas food rich in carbohydrates can damage the teeth. Smoking damages the oral cavity. Certain medications can also reduce the flow of saliva which can lead to an increase in bacterial growth in the mouth. Diseases like diabetes and HIV reduce one’s immunity and make one susceptible to oral infections. Oral inflammation is also seen as a side effect of chemotherapy. Cardiovascular diseases, low birth weight, endocarditis, osteoporosis are a few of the diseases linked with poor oral health. However, the body’s natural defences and good oral hygiene habits can protect an individual from disorders related to the oral cavity. 6. Turmeric for toothaches, swelling, etc. Turmeric is a famous curry spice that is used generously by Asians in their food as well as a medicine. Turmeric belongs to the ginger family and turmeric powder is obtained from its rhizome. Curcuminoids is a class of compounds found in turmeric powder that are strong antioxidants and they are responsible for the bright yellow color of the spice. Curcumin is the principal curcuminoid that demonstrates the pharmacological properties of turmeric. The volatile oil fraction of turmeric gives the spice its flavourful aroma and also contributes to the therapeutic properties. Turmeric possesses a number of properties of clinical significance such as anti-inflammatory, antioxidant, anticancer, antimicrobial etc. Research studies suggest that these properties can be of use in dental problems and diseases related to the mouth. Gingivitis is the mild inflammation of the gums characterized by swelling and irritation. Plaque is a film of bacteria that grows on the teeth and another surface of the mouth. A study was performed to compare the effect of turmeric mouthwash to that of standard treatment-chlorhexidine gluconate mouthwash in treating gingivitis and plaque. Subjects of the age group 25-35 years participated in this study. Their plaque and gingivitis index score was measured at 0, 14 and 21 days. Significant reduction in plaque index and a microbial count was observed in both groups. No difference in the gingival index was seen in either group. However, chlorhexidine gluconate mouthwash was more effective when the antiplaque property was considered. What it means: Nevertheless it is important to note that turmeric mouthwash is as effective as chlorhexidine mouthwash and can be used as an adjunct and low cost measure to control plaque. Periodontitis is inflammation of tissues supporting the teeth. If left untreated, it can lead to loosening and loss of teeth. Root planning: smoothening of roots surfaces to prevent the future build-up of plaque. However, the treatment is invasive and requires multiple visits, use of local anesthesia and antibiotics. A study was conducted to compare the effect of turmeric gel along with Scaling and Root planning (SRP) and the effect of SRP alone on the plaque, gingivitis and other factors pertaining to periodontitis. 30 patients participated in this study wherein certain parts of the affected sites of their mouth were treated with SRP alone and some with turmeric gel and SRP. Significant reduction in recorded parameters was seen in both groups but turmeric gel combination brought about greater reduction than SRP alone. This effect can be due to turmeric’s anti-inflammatory and anti-microbial property. Oral cancer is the cancerous growth of cells in the mouth. Use of tobacco, excessive alcohol consumption, lack of oral hygiene, etc. are some of the factors that can lead to oral cancer. Curcumin possesses anti-cancer property and it is effective in controlling and terminating cancerous growth. China Medical University investigated the effect of curcumin on drug-resistant oral cancer cell lines. Considering the limitation of poor bioavailability, a special formulation of curcumin was prepared. Curcumin brought about cell death in oral cancer cells; however, it was not toxic normal human gum cells and other cell types found in the normal human cavity. Curcumin modulated the activity of multiple drug resistance protein-1 (protein that confers resistance to routine treatment and enhances survival potential of cells) and stimulated the production of reactive oxygen studies in cancerous cells leading to cell death. Nanoparticle formulation of curcumin can thus serve to be therapeutic in drug-resistant oral cancer. Turmeric’s role as an anti-cancer is well known. It is no surprise it can help in oral cancer too. Oral submucosal fibrosis (OSMF) is a disease in which tissue comprising the lining of the mouth hardens and changes in the composition of the muscle connecting the mouth increase difficulty in opening the mouth and affect activities like eating and swallowing. Patients suffering from this condition are at increased risk of developing oral cancer. The anti-inflammatory and antioxidant activity of curcumin is responsible for its chemopreventive action. A research study was conducted to evaluate the efficacy of turmeric treatment for oral submucosal fibrosis. 30 patients participated in this study and they were split into four groups based upon the extent to which they could open their mouth. Each patient was administered curcumin tablet containing 300mg curcumin and 5mg piperine thrice daily for 1 month. Patient’s mouth opening and burning sensation were recorded. Results from the four groups indicated that mouth opening improved in the range of 0.7-5.1% whereas burning sensation reduced by 66-83%. If overall improvement is considered turmeric did not affect mouth opening but significantly reduced burning sensation. It was concluded that turmeric has a therapeutic effect on individuals suffering from oral submucosal fibrosis but further research is required. A similar study was performed at Government Dental College, Trivandrum, India wherein forty-eight patients were split into 3 groups. 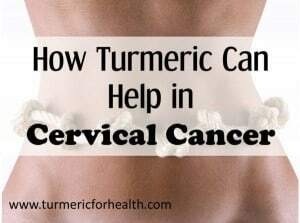 Each group was administered only one of the following drugs: curcumin(daily dose of 1 gram), turmeric oil(daily dose of 600mg) and standard treatment tablets (daily dose of 1 gram). Patients were evaluated every 15 days for 9 months. Groups receiving turmeric showed the significant reduction in burning sensation and intolerance to spicy food within 3 months of treatment. These groups also reported complete relief from pain and demonstrated a significant increase in mouth opening. None of these effects were observed in the control group. Curcumin brought about quick changes whereas turmeric oil had a slow but long term effect and it even reduced the lesions. Results of this study indicate that both anti-inflammatory and antioxidant activities of turmeric make it a potential candidate to treat OSMF. As mentioned previously, oral mucositis or inflammation of the mucosal layer lining the oral cavity occurs as a side effect to radiation therapy for head and neck cancer. 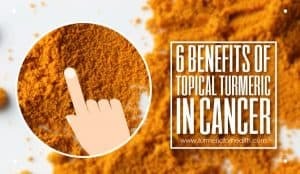 80 patients who were receiving chemoradiotherapy for head and neck cancer participated in a study which was designed to investigate turmeric’s effect on radiation induced mucositis. 40 patients were given turmeric mouthwash and the other 40 were administered povidone-iodine treatment for comparison. Based on results recorded over 7 weeks, it was observed that turmeric mouthwash prevented and reduced radiation-induced oral mucositis. Turmeric mouthwash also reduced the incidence of intolerable mucositis, reduced changes in body weight and prevented breaks in treatment. It was concluded that gargling with turmeric during treatment of head and neck cancer can prevent and reduce radiation induced mucositis. Apart from serving as a herbal remedy, turmeric finds its use in different forms in dental problems. Dental plaques are not visible to the naked eye. They are generally stained with dyes so as to spot their location for removal. A dental plaque detection system has been designed wherein the staining agent contains turmeric extracts and curcumin and light emitting apparatus is used. The apparatus emits light at a particular wavelength which helps to identify the plaque. Sealants are an artificial coating applied to the teeth to protect them from decay. They are applied to pits- hollow regions and fissures- grooves of the back teeth. Turmeric extract is one of the colorants used in preparing a sealant which is generally composed of plastic and one colorant. Turmeric, due to its anti-inflammatory property, can be applied locally or taken as an alternative to nonsteroidal anti-inflammatory drugs to treat aching gums or teeth. 1. Massaging aching teeth with roasted, ground turmeric can help reduce pain and swelling. 2. Prepare turmeric water by boiling 5g of turmeric powder, two cloves and two ground leaves of guava in 200g water. Let it cool. Rinsing the mouth with this water can provide instant relief from dental problems. 3. Prepare a paste by mixing 1 tsp of turmeric with ½ tsp of salt and ½ tsp of mustard oil. Rub this paste twice daily on gums and teeth for relief from gingivitis and periodontitis. 4. To prepare a gum pack wet a pinch of turmeric powder in water or in Vitamin E oil and apply it at night to the affected areas. One can also roll this paste in gauze and tuck it in the mouth. 5. Applying the powder of burnt turmeric pieces and bishop’s weed seed (also known as ajwain ) on teeth and cleaning them helps strengthen gums and teeth. 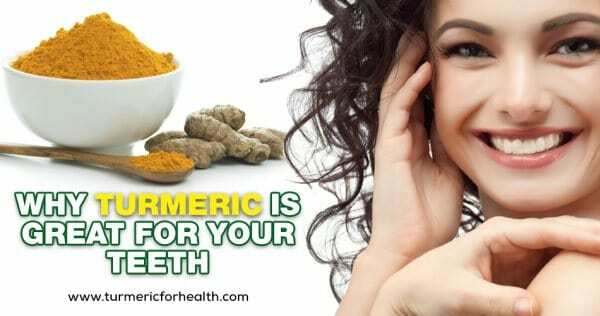 Former sufferers of dental and gum problems recommend brushing teeth with turmeric powder as it has cured their problems of bleeding gums, periodontitis and bad breath. However turmeric stains the teeth yellow, so it is advisable to follow this routine with regular toothpaste. This dosage section is for oral use of turmeric. Turmeric incorporated in the diet is the safest way of consuming it. This study was conducted to assess the efficacy of Curcuma gel in gingivitis. This study was conducted on 10 patients suffering from severe gingivitis. It was primarily done on those patients who did not receive any kind of periodontal therapy in the last six months. The 10 selected patients with a papillary index score of 3 (higher bleeding) were asked to apply Curcuma gel after brushing twice a day regularly for three weeks. They were also asked to leave the gel in the mouth for 10 minutes before rinsing with water. The results were recorded in the form of tables in a proforma sheet at different time intervals like 0, 7, 14, 21 days. The aim of the study was to analyze the parameters like papillary bleeding index and gingival index with the help of a visual analog scale. The papillary bleeding index is used to assess the overall health of gingiva mainly the bleeding tendency of gingiva while Gingival index is used to analyze the gingival condition along with the qualitative changes like change in color of gingiva or swelling of gingiva. Initially (day 0) the bleeding was very high. On day 7 the bleeding was considerably less and with time the bleeding got significantly reduced. On day 21 the papillary bleeding score was reduced to as low as 1.25. The application of Curcuma gel didn’t show any adverse allergic reaction or ulceration. There was a drastic decrease in inflammation when Curcuma gel was applied thrice daily for three weeks continuously. The color of the gingiva also improved significantly from reddish pink to pale pink. At last, the study shows that the Curcuma gel is a potent herb in treating gingivitis due to its anti-inflammatory and anti-microbial properties. Curcumin is a hydrophobic polyphenol and an active constituent of Curcuma longa (turmeric). It posses many properties of which anti-inflammatory and anti-bacterial activity is of paramount importance in gingivitis. Curcumin exerts its effect as an anti-inflammatory agent by inhibiting the activation of nuclear factor kappa-B (a transcription factor) as well as by inhibiting the activity of pro-inflammatory enzyme cyclooxygenase-2 which in turn reduces the inflammatory mediators involved in arachidonic acid metabolism. It is also better than other anti-inflammatory drugs like aspirin as it does not affect the synthesis of prostacyclin which is responsible for inhibiting the platelet aggregation that leads to the formation of dental plaque but selectively inhibits thromboxane which facilitates platelet aggregation thus forming dental plaque. Another potent mechanism of curcumin in gingivitis is its antimicrobial activity. The major microorganism which plays a key role in the progression of gingivitis is P.gingivalis. It possesses a spectrum of proteases including trypsin-like enzymes. These enzymes enhance the ability of P.gingivalis to destruct the periodontal ligaments and tissues. The possible mechanism by which curcumin exhibits its antibacterial activity against P.gingivalis and other pathogenic microorganisms is by blocking the assembly dynamics of FtsZ in the Z-ring . You might be wondering what this FtsZ is and what is its role here? FtsZ is an essential bacterial protein which assembles by itself at a particular site called “Z-ring”. This ring plays an important role in bacterial proliferation as it provides energy for it. Curcumin is also a powerful anti-oxidant. It reduces oxidative stress which occurs due to the imbalance between body’s own antioxidant defense system and reactive oxygen species (ROS). This ROS plays a major role in periodontal tissue destruction. As we can see from the above study and its results that a daily application of Curcumin gel for three weeks continuously can significantly improve the symptoms of gingivitis like inflammation, bleeding and reddening of gums. This proves that Curcuma (Turmeric) is an effective adjunct that can be used in the treatment of gingivitis and plaque removal. The turmeric gel showed no visible side-effects and was biocompatible in nature. A research published in 2012 in the Journal of Indian Society of Periodontology aimed at comparing the ability of turmeric and chlorhexidine gluconate mouthwashes in intercepting the development of bacterial infections like gingivitis and plaque. The study comprised of 60 patients suffering from gingivitis. Half of them were asked to use 0.1% turmeric mouthwash and the other half was given 0.2% chlorhexidine gluconate mouthwash for 21 days. Changes in the severity of plaque and gingivitis after 0, 14 and 21 days were analyzed. After 21 days, the researchers deduced that the severity of plaque and gingivitis reduced significantly in both groups. Both turmeric and chlorhexidine were nearly equally efficient. Turmeric reduced plaque by 69.072% and gingivitis by 62.545%. Chlorhexidine, on the other hand, reduced plaque by 64.207% and gingivitis by 61.150%. Turmeric was found to be more effective on both counts if we consider the exact percentages! From these facts, we can infer that both turmeric mouthwash and chlorhexidine mouthwash are efficient in preventing and reducing the severity of oral infections like plaque and gingivitis owing to their anti-inflammatory and anti-bacterial characteristics. But considering the facts that concentration of chlorhexidine mouthwash was twice that of turmeric mouthwash;, and that continuous chlorhexidine usage can produce various adverse effects, it would not be wrong to say that turmeric, in the end ,may be better than chlorhexidine in maintaining good oral health. This study elucidates the extent of effectiveness of curcumin in case of Oral Submucous Fibrosis (OSF). This was a clinical trial conducted on 30 OSF patients. They were assigned into 2 groups, with 15 people in each group. One group was tested group and another one was the control group. The test group was put on a regime of commercially available Curcuminoids named Longvida(400mg lozenges, daily intake of 2gm lozenges). The control group was under the steroid tenovate (0.05% of clobetasol propionate)ointment regime. This ointment had to be applied thrice a day. Both these regimes lasted for 3 months and follow-up analysis was done at the end of 6months. Both groups were advised to regularly perform some physiotherapy exercises involving the movement of the mouth and the jaws. This mouth exercise device (MED) based had to be done for 20 min, 10 min for each side. This is done thrice a day. OSF is diagnosed based on the reduction of the interincisal distance (distance between your 2 jaws at mouth opening) in mouth opening and fibrous bands found in the oral mucosa. Patients were asked to forego the use of tobacco 1 month prior to the start of the drug regime. The baseline for mouth opening and the fibrous bands were noted for each group at the start of the experiment. This was then compared with the results after the 3months trial and the 6-month follow-up. Visual Analogue Scale (VAS) measurements were also monitored. This is to check the burning sensation caused by the intake of hot & spicy food. This is another parameter to monitor OSF and common tooth sensitivity. Keeping all these parameters in mind the results were analyzed. The results showed some drastic changes. There was a 5.93mm increase in mouth opening in the test group. This is 2.37mm deviation from the baseline. In case of the control group, the increase in the mouth opening is of 2.66mm. A meagre 1.76mm deviation from the baseline. Burning sensation on an intake of spicy food reduced in the treatment group but this was not observed in the control group. The results of the test group showcased a sustained outcome, even 6months after withdrawal of the treatment. On the other hand, the control group had a relapse of disease parameters 6 months after treatment withdrawal. Thus, it is clearly illustrated in this study that curcumin had a far more sustained effect than conventionally applied steroids used in OSF. The anti-inflammatory and anti-oxidant effects of curcumin are the chief mechanism of action against Oral Submucous Fibrosis. Curcumin inhibits NF-κB activation pathway. The level expression of this pathway is very high in OSF patients. It is one of the essential cell signaling pathways for the disease to occur. The inhibition of COX-2,lipoxygenase and inducible nitric oxide synthase (iNOS) enzymes by curcumin plays a major role in this. Also, the blocking of certain pro-inflammatory cytokines like IL-12, IL- 8, IL-6, TNFα reduces inflammation in the mouth. Thus affecting OSF patients by relieving the pain and burning sensation. The anti-oxidant property of curcumin causes a scavenging effect on superoxide and hydroxyl radicals. This results in a reduction of oxidative stress (imbalance between prooxidant and antioxidant agents). It reduces lipid peroxidation (degradation of lipids which damages tissue). All these factors are responsible for the reduction in the burning sensation caused due to intake of spicy foods. Overall, this study reveals the efficacy of curcumin as an alternative cure for Oral Submucous Fibrosis. The lack of any side effects and the relative sustained effect of curcumin makes it a far better cure than conventional steroids. The study was a randomized, double blind, clinical trial and was carried out for a period of 6 months.Detailed case history was made. 60 patients diagnosed with recurrent aphthous stomatitis were selected for the clinical trial based on various inclusion and exclusion criteria. Group I had 30 participants. They were given curcumin gel for the treatment of RAS. The other group was given a standard treatment of Triamcinolone Acetonide gel. The size of ulcer was measured by a sterile Vernier Caliper. The number of ulcers was also noted down. The pain score was measured for each participant in the study and noted down. A strict uniform protocol for administration of gel was followed. Patients were asked to apply the gels thrice a day on each of the ulcer post their meal. They were asked to not consume food or water for at least half an hour. The same type of applicator was provided to everyone and the quantity of application was also fixed. Patients were examined on alternate days and the following parameters were noted down. The curcumin gel used was Curenext oral gel that contained 10mg of Curcuma longa extract per gram of gel. Triamcinolone Acetonide gel used for the study was Kenacort oral paste that contained 0.1% triamcinolone acetonide. 60 patients were involved in the study. They were randomly assigned in groups of 30. There was no significant variation in the demographic data of the patients in the two groups. The pain scores were compared. The pain score of group I from day 0 to day 7 was calculated to be 4.7±1.53. The means that the average level of pain on a scale of 10 was found to be 4.7. The pain score for group II patients was found to be 4.5±1.43. Group II patients on an average rated their pain from day 0 to day 7 as 4.5. The result implies that there was a notable reduction in pain in 7 days in both groups. Statistically, there was no significant difference in pain scores between the groups. Another parameter that was recorded was the number and size of ulcers. The results show that over the period of 7 days the size and number reduced remarkably for both groups of people. There was no considerable difference in the parameter result between Group I and Group II. This study showed that curcumin is effective in reducing pain and healing the ulcer. It effectively reduces the size and number of ulcers. Treatment of oral ulcer aims at relieving pain, reduce inflammation and promote healing. Curcumin downregulates the expression of interleukin (IL)-6 protein, TNF, and various other chemokines. This leads to suppression of inflammation. One such mechanism is by decreasing the rate of release and metabolism of arachidonic acid. Arachidonic acid is a polyunsaturated fatty acid present in the cell membrane. It is an intermediate in the inflammation pathway. Also, it is a vasodilator that is responsible for the redness of the affected site. Oxygenation of arachidonic acid produces prostaglandins by cyclooxygenase pathway and leukotrienes from lipoxygenase pathway. A decrease in arachidonic acid metabolism reduces the activity of cyclooxygenase and lipoxygenase, which are inflammatory enzymes. It prevents oxidative damage of the cells. Curcumin decreases the level of lipid peroxides. This prevents Oxidative degradation of lipids which in turn reduces tissue damage. Curcumin elevates the level of superoxide dismutase (SOD) that breaks down potentially harmful oxygen molecules. Catalase (CAT), glutathione peroxidase (GPx) levels also increase due to curcumin. This prevents the cells against oxidative stress. Oxidative stress is the imbalance between the production of free radicals and the ability of the body to neutralize the harmful effect of free radicals by antioxidants. This leads to aggressive cellular damage. Reduction in oxidative stress initiates wound healing. It improves collagen synthesis and maturation, wound contraction and finally epithelialisation. The wound is covered by a new layer after it is filled with well vascularised healthy tissues. Curcumin increases the activity of transforming growth factor-beta1 and fibronectin which is responsible for the enhancement of wound healing. This implies that curcumin can heal oral ulcer and relieve the pain as effectively as a steroid. Steroids have unwanted and non-reversible side effects. Turmeric has a pharmacological activity that is similar to steroids. Turmeric, if taken in required dosage, can be a safer, economical and effective alternative to steroids. Turmeric as a spice is very safe to use. However one must be careful with turmeric supplements as it is a concentrated form of curcumin and may contain other components which are included to enhance its availability in the body. Inappropriate dose or allergic reactions from supplements can affect one’s health; so it is advisable to take turmeric supplements as per a health practitioner’s recommendation. If consuming medications that reduce stomach acid and/or blood thinning agents. Hello! Do you have a recipe for cheek swelling?? My mom woke up swollen and seems to have scratched the upper gum inside mouth. Now she has a swollen right cheek. Please, any advice is greatly appreciated! Hi. She could apply organic turmeric powder mixed with coconut oil or honey (honey may cause some burning sensation initially) to the upper gums or inner cheek. She can apply it 2-3 times a day. This could help only in case of mild conditions. Please consult a dentist as well. Hi, I just recently noticed my 4 year old daughter has a gum boil. 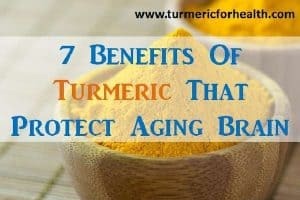 For her age is tumeric and salt water safe to use as a rinse? It’s Saturday and I can’t get into a dentist at the moment. I just want something to help her until then. Hi. Turmeric is safe for a four year old. Turmeric mixed with coconut oil benefits in oral health conditions as a preventive measure and this may help it from getting worse till you meet the dentist. Curcumin in turmeric is insoluble in water so the rinse may not be of much help. Hi, i’ve just been advised by my dentist that i have a wisdom tooth coming through and the xray shows an area around it that looks like a cyst – they believe it is most likely a Dentigerous cyst however they have advised i have to travel to see an oral surgeon to have a consult and then get a biopsy to make sure it is nothing more sinister. I am personally keen to rub it with turmeric paste to see how it goes – your thoughts? I make turmeric paste according to Doug English’s recommendations and take it twice daily, 1 teaspoon at a time. Thank you. Application of the turmeric paste to affected areas in oral health conditions does deliver some great results in terms of reducing inflammation and pain and supporting healing. Theoretically it should help with the symptoms but we aren’t really sure if these properties would be applicable for this dental condition. Hope this helps. I just heard that there is a dentist who developed a toothpaste that has turmeric in it. Very eager to see it on the shelf ! I plan to make a paste for a slight gum issue I have at the moment. I’ll mix equal amounts if coconut oil and turmeric powder, and perhaps add a few drops of clove oil and store in the fridge. I will regularly rub a small amount of the mixture directly onto the gum margin using my finger, and just leave it, like a topical ointment. Hi Ella. That is an excellent and safe home remedy. Ensure that the clove oil is well diluted in coconut oil as it is extremely spicy. Do update us with your results. What is the recipe for the mouthwash for someone undergoing oral radiation? Hi. You can simply boil turmeric in water and cool the extract and use it as a mouthwash. However if radiation therapy is involved we would also suggest using the Golden Paste in addition to the mouthwash so as to strengthen the body and fight any adverse effects. is a coconut oil, baking soda, turmeric mixture safe to use everyday and as a complete replacement of toothpaste entirely or should I still use toothpaste as well? Hi. This would depend on personal experience and choice. Turmeric and coconut oil is great for dental and oral health and adding baking soda helps in better cleansing but it depends on you whether you would like to replace toothpaste entirely with these components. Very true.I had loose tooth n gum swelling n it took it away.I put ba king soda n ginel powder in my tooth paste.n sometimes coconut oil to it mkes ur teeth shine n gets rid off bateria in gums as well.for gum inflamation I dip my finger in tumeric n rub it 9n my gums.needed no antibiotics. That is fantastic Sara. Thank you for sharing this. I used pinch of turmeric and a pinch of salt in lukewarm water and rinsed my mouth before sleep and amazingly it cured my bleeding and aching gums. Glad to hear that turmeric benefits you! Turmeric is generally known to aid in teeth whitening but yes it can mildly stain your teeth which should fade away in no time. I use turmeric but know that it contributes and exacerbates gall stones. 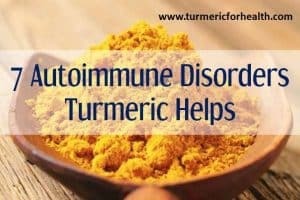 How can I overcome this while continuing with the turmeric? Turmeric does not contribute or exacerbate gall stones. It causes gallbladder contraction which is painful if gallstones are present. However this occurs only at high doses of turmeric. 1 Capsule of a Florastor probiotic (emptied of course) Any probiotic would do. I mixed in a small glass jar and put in a small plastic spoon to spread on tooth brush..Of course, I didn’t want to dip toothbrush into my mixture! AND THEN, I thought to myself “wouldn’t this make a great facial too?”. So ~15 minutes before my shower, I took about 1/2 TSP and rubbed well all over my face, concentrating on problem areas (like little wrinkles and blackhead prone areas). I rinsed face in the shower but didn’t use wash cloth to scrub off as the scrubbing had already been done. Face left feeling soft and clean! Turmeric can be used to whiten teeth, too. It seems weird, because turmeric is famous for staining everything, but for some reason, it can be used to whiten teeth! Its true! My daughter and I tried it and the results were striking – more effective than whitening strips that I have used on occasion in the past. And, without the chemicals, stinging, or occasional tooth pain. It doesn’t leave your teeth with an unnatural bleached look, but with a natural, clean, healthy white appearance. It removes the yellow appearance that can accumulate over time. I found this recipe online. It’s very simple: put a small amount of powder on moistened tooth brush and brush as you would normally, but do not rinse. Leave it on for 3-5 minutes, then brush with your normal toothpaste as usual. The yellow will be reduced significantly. If you don’t notice a huge difference, repeat the process over the next few days. The results will be amazing, and you’ll never use any tooth whitening products again! What is the recipe u used? Why don’t they make a ready to use oral spray?? suggest consider adding a “healthy fat” such as coconut oil or milk when consuming turmeric and black pepper. Also at this link go to #3 at the end see recipe. I do this and add black pepprt – after straining to remove some of the residual powder add coconut oil or coconut milk and blend briefly while still hot to emulsify. I mixed 6 teaspoons of turmeric with a tablespoon of organic coconut oil and applied to tooth and relief was instant! Thank you so much for your help. I am trying this Elisa Lenz.